Current bud stage pictures will start next week. 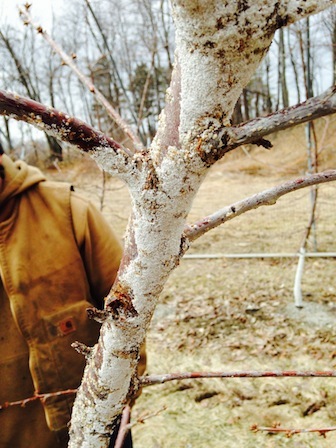 As of March 31, 2014, with snow on the ground at the UMass Orchard in Belchertown, buds were still dormant. Although this Honeycrisp bud looks pretty swollen! 15-April, 2014 Fruit Twilight Meeting at Red Apple Farm, 455 Highland Ave., Phillipston, MA. 5:30 to 7:30 PM. 1 pesticide credit will be offered. Light dinner will be served. Orchard walk, current orchard management updates, SWD and BMSB update. $25 meeting fee ($20 for MFGA members.) Contact: Jon Clements, 413-478-7219. Pre-registration is not necessary. 17-April, 2014 Fruit Twilight Meeting at Steere Orchard, 155 Austin Ave., Greenville, RI. 5:30 to 7:30 PM. 2 pesticide credits will be offered. Light dinner will be served. Grafting demonstration and orchard management update. $20 meeting fee for other than RIFGA members. Contact: Jon Clements, 413-478-7219. Pre-registration is not necessary. This will be your next-to-last Healthy Fruit (HF) unless you go to the UMass Extension Bookstore (http://umassextensionbookstore.com) and purchase a new 2014 subscription to HF ($50, e-mail delivery only) in the next week or two. Alternately, you can use the mail-in form at the end of this week’s HF. Last week I ran across this rather heavy infestation on sweet cherry of what I believe is white peach scale/white prunicola scale. (It’s an academic point which species it is unless you are an entomologist I suppose?) Note this is not the more common San Jose scale, which does seem to be becoming more abundant too. Of interest is the fact that this scale has traditionally been a more southern species, but this is the second time I have ran across it now. (The first, in the fall of 2012 in a peach orchard in southeastern MA.) The first picture (below) is a more typical scale appearance, but note on the opposite side of the tree is the feathery coating produced when scale sheds it’s skin over time (second picture below). 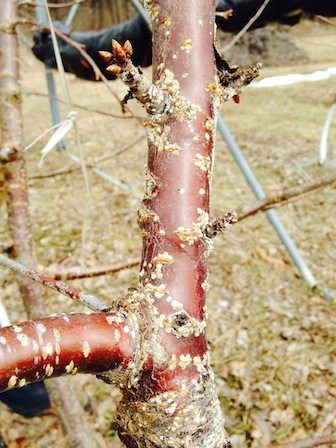 Although not widespread on many trees, this infestation deserves serious treatment: the 2014 NETFMG suggests oil (2%), Assail, Centaur, Esteem, or Lorsban as treatment options in the late dormant bud stage. All growers should be on the lookout for scale (all kinds) and re-consider late dormant oil applications at 2% to keep it at bay. Shooting blanks? If you haven’t noticed, precision orchard management is the latest buzz. Precision crop load management is a component. Precision pruning combined with chemical and hand thinning leads to precision crop load management. What do we mean by precision pruning? Well, it means knowing the desired final crop load on a tree, then counting the actual number of flower buds on a tree at pruning time which determines the actual crop potential, and then pruning off enough buds to give a ratio of app. 1.5:1, where the first number is the number of flower buds left compared to the desired crop load. In other words, if a tall-spindle apple tree is desired to have 100 fruit on it at harvest, then the tree should be pruned to leave 150 flower buds (left). That’s a 1.5:1 ratio. It’s harder than it sounds, particularly on a variety like Honeycrisp which is prone to having “blanks,” ie., what looks like a flower bud but will actually not bloom into a flower. This is what happens when trees are over-cropped the previous year. 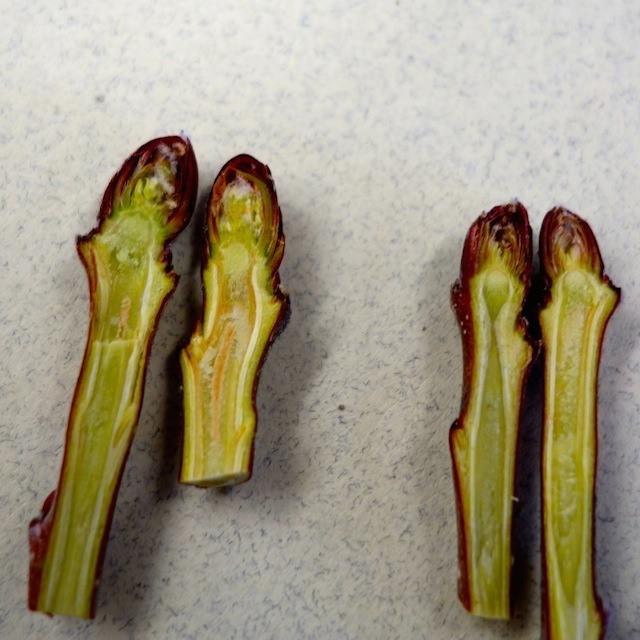 I looked around a bit at the UMass Orchard and found what appear to me to be “blanks” vs. good flower buds. (See below.) Typically, the blanks are less robust-looking (vs. “fat” buds). Just keep this in mind when attempting precision pruning. I will have more on precision crop load management in future HF’s. 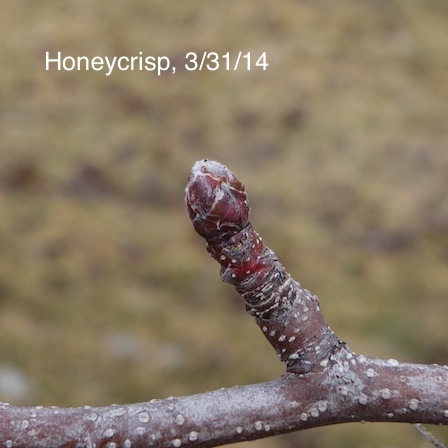 Honeycrisp buds collected 3/31/14. Two buds on left, although appear to be flower buds, are, much smaller (less "fat") than buds on right. Two buds on left are likely to be "blanks." Question: What is UMass Extension predicting for winter moth caterpillar populations this spring? Answer: Each November to the early part of January, UMass Amherst Entomologist, Dr. Joe Elkinton, and his staff conduct intensive monitoring of winter moth flight in several areas of Massachusetts east of Worcester, especially along the coast including Cape Cod and the Islands, where winter moth has become established. Trees are banded and winter moth females are captured and their eggs are counted. According to Dr. Elkinton and his staff, there was a significant moth flight last fall and a significant number of eggs were laid in those areas where winter moth has been a problem in previous years. The exception to this is in the town of Wellesley, one of seven release sites where Dr. Elkinton released the predatory fly Cyzenis albicans. Of all the release sites, the Wellesley site is showing high levels of parasitism of winter moth and winter moth numbers appear to have declined dramatically. In those other areas where winter moth densities have been high in the past, Dr. Elkinton expects high numbers of caterpillars this spring, but “the wildcard is whether the subzero temperatures we have seen this winter have killed a lot of winter moth eggs”. Unfortunately, we will not know this until eggs start to hatch in the spring. Question: When does winter moth egg hatch begin? Answer: Depending on the type of winter, snow cover, geographic location and site microclimate, winter moth egg hatch usually occurs in early to mid April, and again, this can vary depending on location. In Hanson, MA, the earliest winter moth egg hatch was on March 24, 2012, but 2012 was an unusually warm winter. Typically, winter moth egg hatch in Hanson usually begins between April 2 and April 15th. Eggs hatch over a period of time, with eggs located on the west and south sides of a tree usually opening first. Question: How do I know if winter moth eggs have hatched in my area? Answer: Check the UMass Extension Landscape Message at www.UMassGreenInfo.org. Also, one of the best ways is to monitor host trees (oak, maple, birch, apple, crabapple, etc). Using a hand lens, gently peel back the bud scales or “leaves” of a bud and look for the black, tiny, eyelash-size caterpillars. Once the winter moth caterpillars start to feed, they turn light green. Question: Winter moth caterpillar defoliation seemed to be down in 2012 and 2013. Can you explain this and why would the numbers be back up this year? Answer: The winter moth egg count for spring 2012 was very high and by all rights it should have been a banner year for winter moth caterpillars; however, weather events changed that forecast. 2012 was a very warm winter with mid-March temperatures in the 80’s and the winter moth hatch occurred very early (1-2 weeks early) in most areas. According to Dr. Elkinton, the warm, 80+ degrees that most likely induced early winter moth hatch was also probably responsible for killing winter moth eggs on the south sides of trees. That year, winter moth eggs began hatching in the greater Boston area on March 21st with a 50% hatch by March 25th, and on the South Shore there was a reported 80% hatch by March 25th. On March 26 and 27th, the temperature suddenly dropped below freezing (teens and twenties in some areas) killing many of the newly hatched caterpillars. So, the March warm temperatures, followed by freezing temperatures, are what likely reduced the winter moth population for 2012. So, overall in 2012, the number of caterpillars that remained to feed and defoliate trees, pupate and eventually become adult moths and lay eggs for 2013 was greatly reduced. As a result, the spring of 2013 produced fewer winter moth caterpillars, which resulted in reduced foliar damage. However, those caterpillars that were produced, fed, pupated and emerged as moths in the fall, and those well-fed females produced many eggs, which are now waiting to hatch this spring of 2014. To sum it up, if there is limited winter mortality (winter kill) of winter moth eggs and there are no major spring weather events (extreme heat or freezing temperatures) at the time of egg hatch or soon there-after, then it looks like 2014 may turn out to be a banner year for winter moth caterpillar defoliation, based on egg counts by Dr. Elkinton’s lab. The 2014 Cornell In-Depth Fruit Growers School was held in Geneva, New York on Tuesday, March 25. A panel of six retiring pomologists discussed physiological principles and their application to fruit production. Each speaker’s presentation provided valuable information regarding horticultural methods for maintaining and improving excellent fruit production in New England. The six scientists who spoke at the conference included Theodore DeJong from UC Davis, Duane Green from UMass Amherst, Scott Johnson from UC Davis, Alan Lakso from Cornell, John Palmer from New Zealand, and James Syvertsen from University of Florida. The message of the six expert scientists is clear: only by understanding the tree’s dynamic response to its environment, can a grower achieve the goals of producing desirable, healthy, sellable fruit. We will be able to better manage our crops if we understand how they function. This is accomplished by practicing precision horticulture. Canopy development, branch manipulation, bud-count pruning, fertigation, plant growth regulators, and chemical thinner application timing each play an integral role in harvested fruit quality. Fruit Dry Matter Concentration (DMC) is a result of carbohydrate acquisition and distribution in the fruit. DMC directly correlates to consumer satisfaction. DMC is achieved by pruning the tree for optimal photosynthetic light interception and distribution. Spur placement in the tree canopy directly influences the size, color, and sugar content of the crop load. Orchard yield depends upon light interception by spurs. Spur leaves support fruit growth from bloom until three weeks after petal fall. Shoot leaves support shoot growth during this time, until they start translocating carbohydrates to the fruit three weeks after petal fall. Peach trees respond excessively to pruning cuts made in the canopy. Proleptic shoots grow vertically from scaffold branches and produce flower buds. Sylleptic shoots are green vegetative shoots that grow laterally out of proleptic shoots. Aggressive pruning cuts made on scaffold branches produce vigorous epicormic water-sprouts. The main problem with Parallel V peach training systems is that excess vigor causes an umbrella effect. Tatura trellises are efficient, but they are expensive to maintain. Freestanding V systems with the new Controller series of rootstocks can result in very productive pedestrian orchards under 8’ tall. Hex V systems can be very productive when an open center canopy is maintained. Optimal timing of fruitlet thinning can increase both fruit size and yield at harvest. To optimize fruit size and yield, crop load adjustments need to be made as early as is economically feasible. Thin the fruit early so that the tree can supply resources to remaining fruit. The Northeast Regional Climate Center (aka NEWA) Carbohydrate Balance Model is a valuable resource for fruit growers in New England. The MaluSim program offers realtime data including the likely carbon balance to adjust thinning practice accordingly. 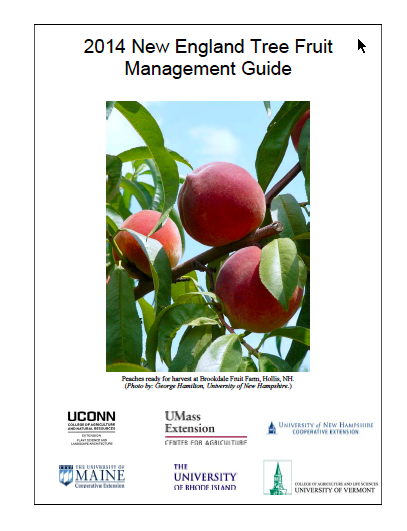 The UMass Extension Fruit Team offers a valuable apple crop thinning spreadsheet on the website. Download the excel spreadsheet from http://extension.umass.edu/fruitadvisor/resources/clements-corner. There are four time periods when apple crop thinning can be executed, but the 7-14mm fruitlet stage is the period of greatest efficacy for chemical thinning. This period occurs approximately one week after petal fall, when vigorous fruitlets are persistent, and weak growing fruitlets readily abscise. There have been recent developments in the technology for monitoring the internal water status in trees. Micro-sensors can be embedded into tree trunks for continuous monitoring of dynamic changes. This technology may have significant benefits for managing water stress in crops, optimizing irrigation timing, and large potential savings in water consumption. Have we reached the limits of productivity? We can still improve orchard design, tree precocity, and dwarf rootstock-trellis training systems. By encouraging spur growth and increasing leaf area index, the rate of photosynthesis can be efficiently spread throughout the tree. The ratio of buds to spurs influences precision production, especially when considering spur placement within the tree canopy, resulting in increased soluble solids and concentrated carbohydrates, which translates to fruit color and maximum eating quality. As temperatures become more spring-like, it's time to go over your disease management checklist to make sure you've done what's needed to reduce overwintering inoculum. These practices set the stage for success by increasing the effectiveness of your later-season fungicide applications and by reducing the risk of an epidemic if conditions turn out to be unusually favorable for a particular disease. 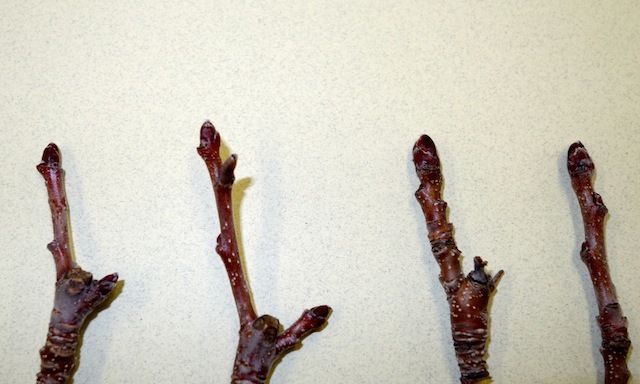 Some things to consider include: 1) prune trees properly to allow light penetration and air movement; 2) make a peach leaf curl spray, either last fall or this spring before bud break; 3) prune out fire blight strikes; 4) destroy overwintering apple leaves by raking, chopping, or urea application before the green tip stage; 5) remove overwintered shoots that show apple powdery mildew; 6) remove cedar apple rust galls if that's possible; 7) remove from peach trees any overwintering mummies; and 8) make a disease management plan for the coming season. The next Healthy Fruit will be published on Tuesday, April 8 or thereabouts, 2014. As always feel free to get in touch with any member of the UMass Fruit Team (http://extension.umass.edu/fruitadvisor/team-members) if you have questions or comments.